Nonsensible Shoes: Thursday Hillary Bash - Not Inevitable. But yeah, inevitable. 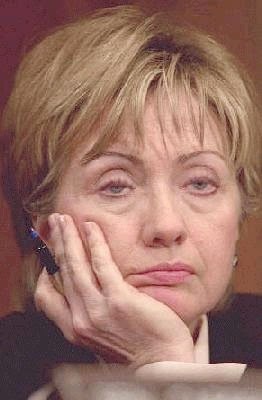 Thursday Hillary Bash - Not Inevitable. But yeah, inevitable. How I'd love to believe this to be true, but color me skeptical. ...After all, Hillary’s problems aren’t only that Democratic knives are becoming unsheathed. Republicans also sense that, with a mainstream nominee, they might actually win in 2016. ...Clinton’s numbers have dropped by 10 or more points, while her three potential opponents have all edged upwards. Going over the litany of recent mis-steps by Clinton (which oddly included distancing herself from Obama on Iraq), doesn't sum it up for Boston Globe columnist Tom Keane. In his opinion, there's something more to it than just her mis-steps. More important, I think, is the simple fact that Clinton is back in the public eye again. Many are remembering why they didn’t like her in 2008, when for a time she also seemed like the inevitable nominee. She’s not warm and fuzzy or exciting. She’s of an older generation when many hunger for someone new. She’s part of the Democratic establishment, only reluctantly embracing the economic-inequality issues that so fire up the party’s left wing. She's not inevitable anymore because her mis-steps and/or reminders have invited potential rivals for the Democratic nominee to challenge her. That makes sense. Republicans too, may not feel so reluctant to run, strengthening the GOP field for 2016 by providing more options for primary voters. Clinton still has the edge on name recognition, access to money, and the makings of a powerful national organization. Even if a number of primary challengers emerge, chances are still good that she’ll end up as the nominee in 2016. That's about as close to inevitable as you can get. As Keane's article indicates, the only thing that can stop Hillary, is Hillary. The good news is she's done it before and she looks to be almost poised to do it again.